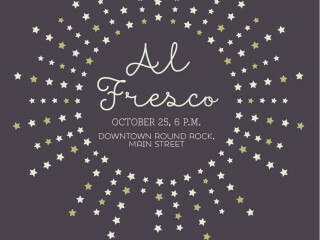 Six restaurants, three boutiques and two spas will be serving up samplings of their signature dishes, holiday sale items and other services at the inaugural Al Fresco event in downtown Round Rock. In addition to the tastings, fixed price menu items and shopping, the event includes live music by the Danielle Reich Quintet. Visit the City of Round Rock website for the full lineup of participating boutiques and restaurants as well as childcare options.